When most climbers ask me what they should do to prepare for a Patagonia trip, I recommend winter climbing in the Cascades. 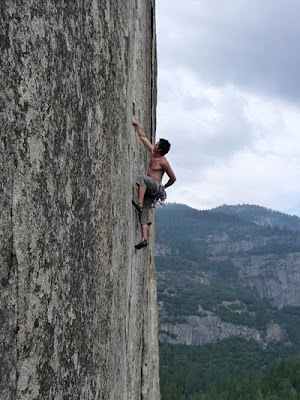 However, because I come from a snow, ice and bad-weather climbing background, the best preparation I can do is to climb a lot of steep granite, and Yosemite is a perfect training ground. 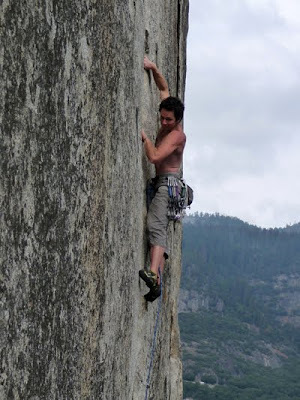 I drove down to Yosemite in early October, and first spent a couple weeks free-climbing. I soon decided though that it was time to finally climb my first El Cap big-wall route. As a warm-up, and to refresh my memory on short-fixing techniques, I first climbed the West Face of Leaning Tower with a friend from Squamish, Nick Elson. Next up was an enjoyable day-trip up Lurking Fear with fellow Seattle-ite, Graham Zimmerman. Lurking Fear had gone quite smoothly, and so I decided I ought to finally climb "the best rock climb in the world," The Nose. Several of my friends had already just recently climbed The Nose and thus weren't interested, so I scanned the Yosemite Lodge cafeteria in search of a partner. Big-wall soloist Dave Turner has already climbed El Cap countless times, and rarely climbs with a partner at all, so I doubted he would be interested, but nonetheless I offhandedly asked, "Hey Dave, wanna climb The Nose tomorrow?" A pleasant surprise, Dave agreed immediately, and a few hours later we were racking up. To take full advantage of Dave's superb aid-climbing skills, we decided to break the climb in two lead blocks: mine the longer but technically easier block to the base of the Great Roof, and Dave's the steeper block from there to the top. Starting by headlamp at 4am, we weren't dilly-dallying but also weren't especially trying to climb fast. Thus we were nicely surprised to top out in bright afternoon sun eleven-and-a-half hours later. Considering how easily the route had gone by, Dave suggested on the hike off that we try the Half Dome - Nose linkup a few days later. I hadn't ever heard of anyone doing the linkup so late in the season, with such short, chilly days - but what the hell, at least it'd be good Patagonia training! I agreed it was an excellent idea, and a few mornings later, on the last day of October, we were hiking up the "Death Slabs" to the base of Half Dome's Northwest Face. There were spots of water-ice on the "Death Slabs," and so considering the chilly air we decided to start Half Dome at the warmest time of the day, and started our linkup at 3:58 pm. Like on El Cap, I led the first half, and Dave took the trickier upper half. I had only climbed Half Dome once, four years ago, but Dave knew the route well. Topping out at 9:30 pm, we were enthused to be ahead of schedule, and scurried down the cables, back down the "Death Slabs," and to our bikes at Mirror Lake. By midnight we were parked in El Cap meadow, blasting Ace of Base, MC Hammer and other appropriately cheesy music to psyche up for The Nose. After cramming in some food and chugging water, we walked up to El Cap, and started The Nose at 12:30 am. Since our previous climb of The Nose was my first I had taken some extra time to find the route, but now that I knew where to go I could climb a bit faster, even by headlamp. I finished my last pitch, to the base of The Great Roof, at 6:30 am, thankful to finally take off my rock shoes and headlamp. Dave blasted off, efficient-as-ever, and soon I was jugging up behind him. As the upper pitches flowed by, I began to look at the watch more often - Our intention was to complete the linkup in under 24 hours, but I began to make 20 hours the new goal in my mind, and yelled up to Dave that it ought to be our new goal, although it was hard to say if it would be realistic or not. As Dave started up the final bolt ladder I yelled something like, "Fifteen minutes to twenty hours!," and he yelled back, "Well, I'll make it under twenty, but I don't know about you!" When the rope was fixed I jugged as fast as possible, and then ran up the final slab with a huge cluster of rope and gear hanging off me. At the tree I immediately pulled out the watch: 11:58 am - 20 hours to the minute! Climbing "Butterballs" at the Cookie Cliff. Butterballs is a spectacular splitter finger crack. Still though, the Cookie Cliff is no comparison to The Lower Town Wall at Index. Tom Evans shot some photos from El Cap meadow while Dave and I were making our first Nose warm-up. This is me leading near the end of my block, in the grey bands. The beauty of short-fixing: Dave already thirty feet up the next pitch as I finish the last lower-out on the Great Roof. Dave beginning the third pitch of his block, as I'm jugging the second. Powered by MC Hammer, Dave in El Cap Meadow, half-way through the linkup.